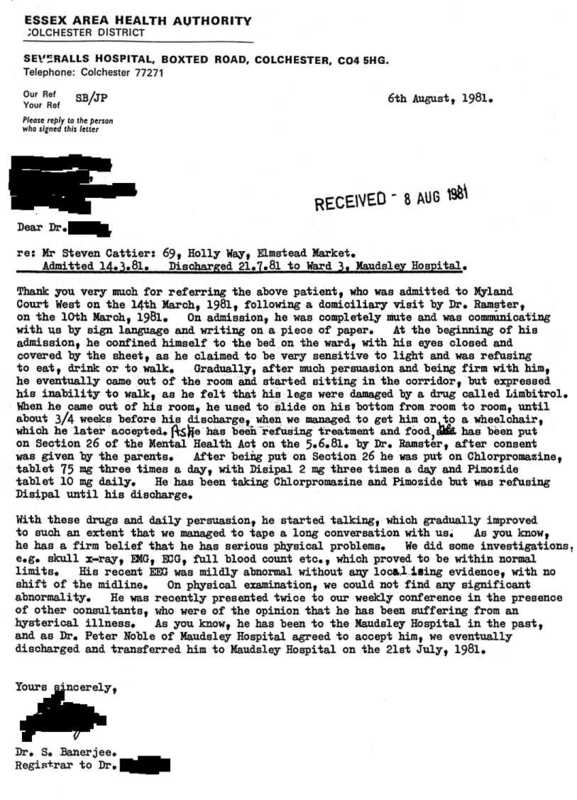 Dr. Banerjee's report of inpatient Stephen Cattier. Severalls Hospital, Colchester. August 1981. Dr. Banerjee, consultant psychiatrist, Severalls Hospital. With respect to Dr. Banerjee, it is untrue that I improved because of persuasion from the staff and being firm with me except for a temporary bit at first - explanation later. I claim I mostly improved because of the medication being put into my food near the beginning without me being told officially which is against the rules I believe, although I have today 9 March 2005 5:10 pm just read in my hospital case notes that I was on Section 30 of the Mental Heath Act so I could be forcibly medicated but I do not know for how long the section lasted exactly. When I was in the ambulance before entering the ward from home I heard my consultant psychiatrist outside say to someone akin to going off to arrange the section. He turned up outside my house with my GP and social workers to forcibly put me into hospital but I went voluntarily as I had no choice. The section must have already been in force then surely. Remember, I claim to be hypersensitive to neurological drugs and so can usually tell if I am having them. Several days later I heard something a nurse said to another nurse when he gave me a drink which indicated it was being medicated; I was on ward Myland Court West by then. I was actually most glad I was being medicated because it was improving me physically and the side-effects were not too bad. I would like to know what they were as they might improve me more now. They knew how opposed I was to psychiatric medication which obviously prompted them to do it surreptitiously. I did inform my consultant psychiatrist (not Dr. Banerjee) of it some weeks later during a consultation session but he denied that it had been done as did the nurse who gave me the drink I just mentioned - he was sitting beside the consultant. Importantly, for the sake of those around me, if I were to expire from respiratory failure from this condition then a murder investigation could unnecessarily ensue if the post mortem missed the brain damage responsible for it (if I go without food for about eighteen hours during the initial stages of a relapse it causes my breathing to stop, but eating food immediately restarts it, and it has happened twice in the past i.e. 1976 and '77 in Claybury and Severalls respectively) as the only conclusion remaining would be murder e.g. a pillow over the face. It has happened to women whose children have died from SIDS (sudden infant death syndrome) and some have even been imprisoned. I did improve to at least drink without having medication when I was once force fed with milk via a stomach tube in the nose on the third day after I was admitted. It was so uncomfortable that I had to eat and drink from then on to avoid a repeat of the procedure. My eating and drinking mechanism had become switched off for the previous five days owing to learning that I was to be admitted to Severalls. It was the psychological effect upon the nerve damage in my mind responsible that the feeling of apprehension produced of knowing I was to be sent to psychiatric hospital for an organic condition that interfered with the eating mechanism and shut down my nerves enough not to be able to consume food and drink. However, having the tube actually slightly damaged the injured nerves more in my mind from the strain of the procedure overusing them which meant that afterwards for a while I was only able to have fluids in front of my face to consume but not food. I was admitted on Saturday I think it was (was 14 March) and over the next one to two days I was forced to take a bath, to dress and sit next to the TV which I was able to do without it causing a relapse from over-using the damaged nerves but only because of my mind temporarily altering in order to cope with it and the adrenalin must have helped things work better too - more nerve fuel produced I suppose. Must sound bizarre I know. It was not a cure though because when I was returned to my room I reverted back to exactly how I had been before i.e. naked, unable to bear room intensity light, and every sense hypersensitive. On the ward at that particular time I always had to keep my eyes shielded from the light anyway. I once gained phenomenal strength and sustained it without it causing a relapse when I hardly had any strength normally when a nurse spent time trying to pull my arm away from my eyes on the second day I was there. I think I got the strength from using Chee, that certain unusual Chinese or Japanese way of summoning up strength. I do not know its correct spelling. If my eyes had been exposed to the light it would have caused a relapse. He managed to pull my arm way a bit though, but I was able to keep my eyes shut to lessen the light's intensity. Pimozide improved my light sensitivity so that I could bear outdoor light intensity for two weeks only before it relapsed to how it had been before i.e. only able to bear indoor light levels. I do not remember refusing food in June 1981. Treatment yes after I had improved a bit. Ordinarily, I could only speak a bit by the time the video was done of me but I was able to speak a lot during it only because I was highly interested in doing it. Interest always makes the injured nerves work better. I hope the tape stills exists as I would like to recall what I said.